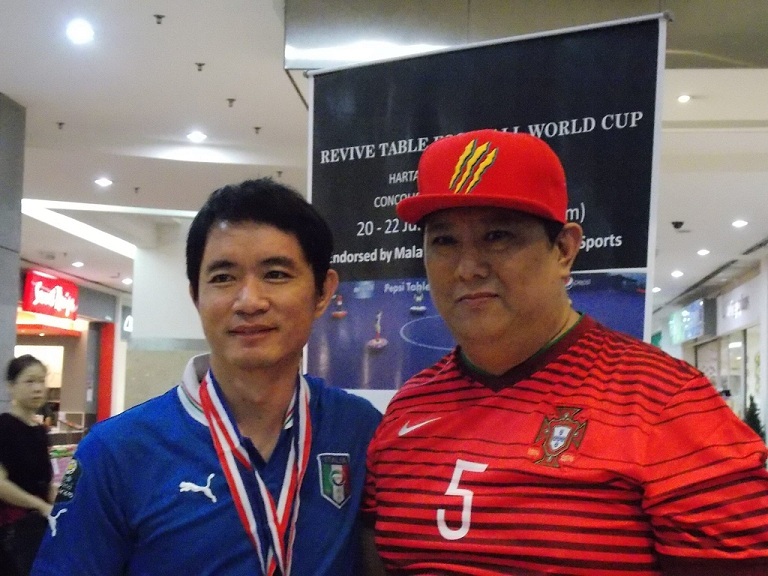 Malaysia had their very first FISTF tournament – REVIVE Malaysia Table Football World Cup 2014 – organised by Hartamas Tigers SC over the weekend. 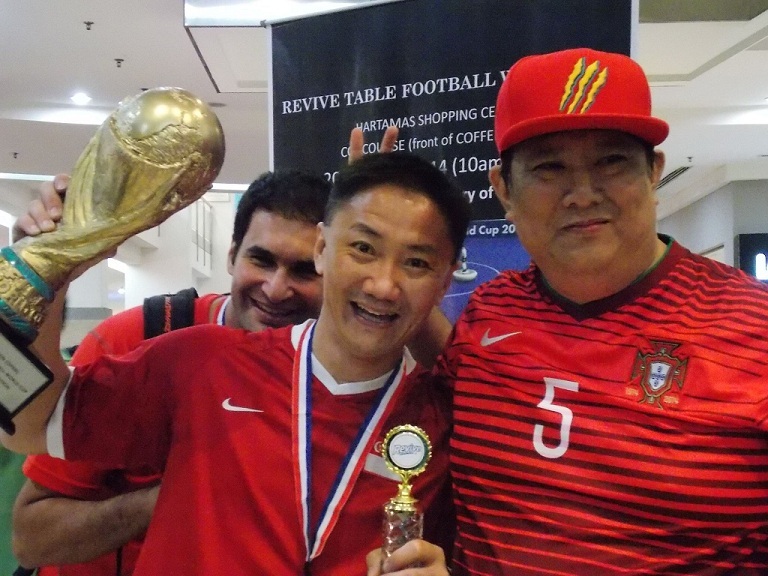 To mark this historic occasion of our friendly neighbour, a total of 13 Singapore-based players (10 Seniors + 3 Jumiors) made the 372km journey up North across the Causeway to the tournament venue at Hartamas Shopping Centre, Kuala Lumpur Malaysia. 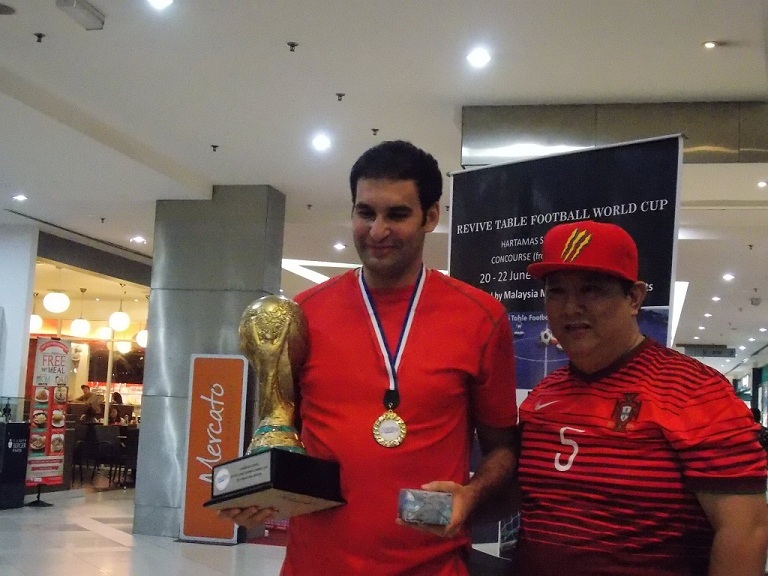 The TFAS contingent included 12 Singaporeans & Frenchman Ouabi Rouis, currently based in Singapore. 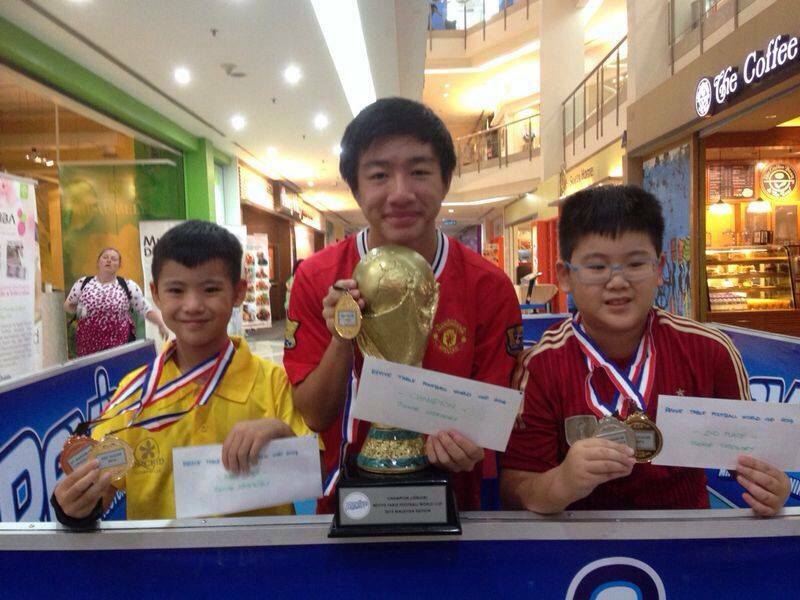 A total of 8 players participated in the Junior event including 3 players from Singapore – namely, Giovanni, Luke & Isaac. The players are split into 2 groups of 4 with the top 2 of each group going into the semi-finals. As expected, Giovanni won his group comfortably with a 100% record – 3 wins out of 3. After a 0-3 loss to Giovanni in his first game, Luke recovered to win his next 2 games to also qualify for the semi-finals in 2nd place. In the other group, it was an extremely tight affair after some unexpected results. 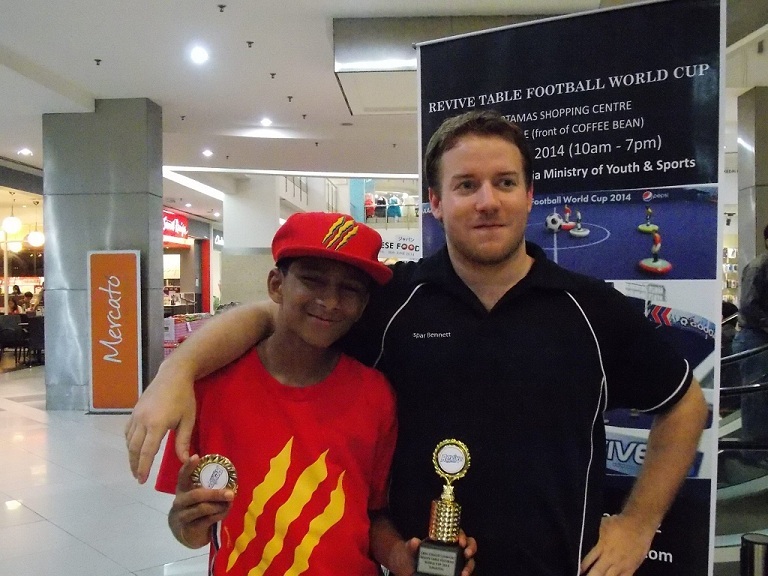 Isaac, after defeating Vishnu 2-1 in his 2nd game, surprisingly lost to Nikhil by 1-2 in his final game. Nikhil, on the other hand, was earlier defeated by Vishnu 1-2 as well. By the end of the group games, all 3 players were tied on 6 points with identical head-to-head results among them. Their final standings had to be decided on goal difference. In this regard, Vishnu the local crowd favourite coached by Kaspar Bennett (the current England No. 1), was far superior after a whopping 7-0 win over Mohnish in his final game. By virtue of a better goal difference to Nikhil, Isaac finished in 2nd place to also make the semi-finals. Both semi-finals were close affairs decided by a single goal. As expected, Giovanni edged out Isaac 1-0. To the disappointment of the home crowd, Luke maanged to eke out a 1-0 win over Vishnu to make it an all-Singaporean final – much to the delight of the travelling Singapore contingent. 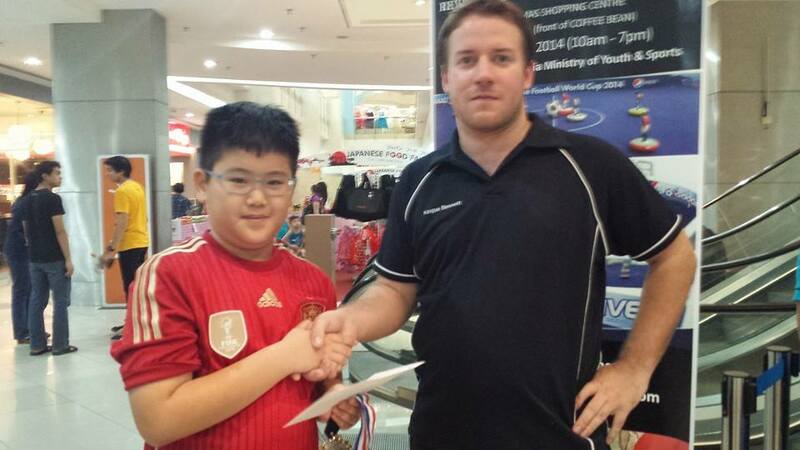 The 3rd/4th playoff saw Isaac playing true to his form with a 3-0 win over Vishnu. The final between Giovanni & Luke – a re-match – was nothing like the earlier group game. Unlike that game which Giovanni won comfortably & handsomely by 3-0, this time round Luke pushed Giovanni all the way. Luke courageously took the game to Giovanni & scored a surpise goal very early in the game. Thereafter, it was all Giovanni – firing shots from all angles & pounding all his firepower on Luke’s defence. Admirably, Luke defended gallantly & could have even taken a 2-0 lead to put the game beyond Giovanni’s reach had his shot not hit the post. With less than 4 minutes left to play, Giovanni’s persistence paid-off after breaking through Luke’s fort-like defence. Giovanni held his nerves & finally scored he equaliser with a beautiful chipped shot. That proves to be the turning point of the game as it calmed down Giovanni. Thereafter, he was able to play his usual game & duly scored the winning goal within the regulation time to be crowned derserving Champion!! Overall, our 3 Singaporean boys – Giovanni, Luke & Isaac – did very well & brought pride to Singapore, their families & themselves. 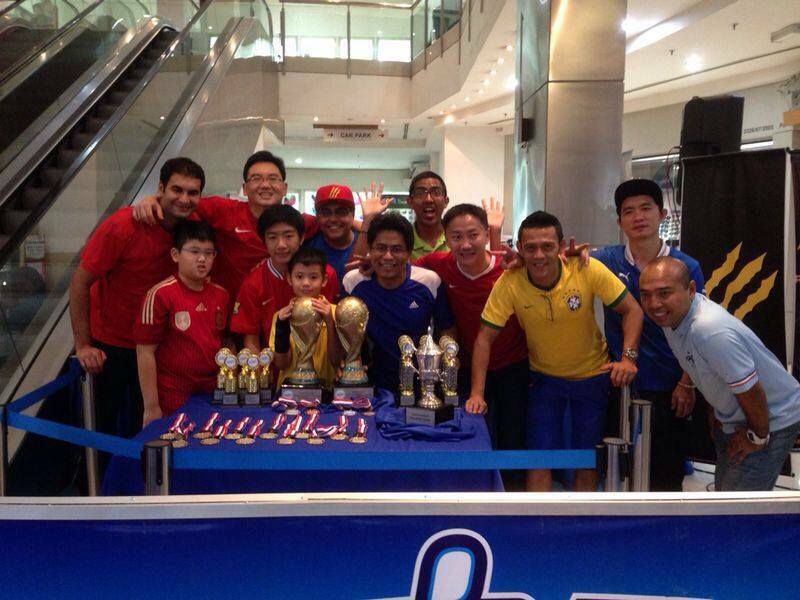 TFAS is proud of their progress & their achievements in this tournament … Congratulations boys, well done & keep flicking!! 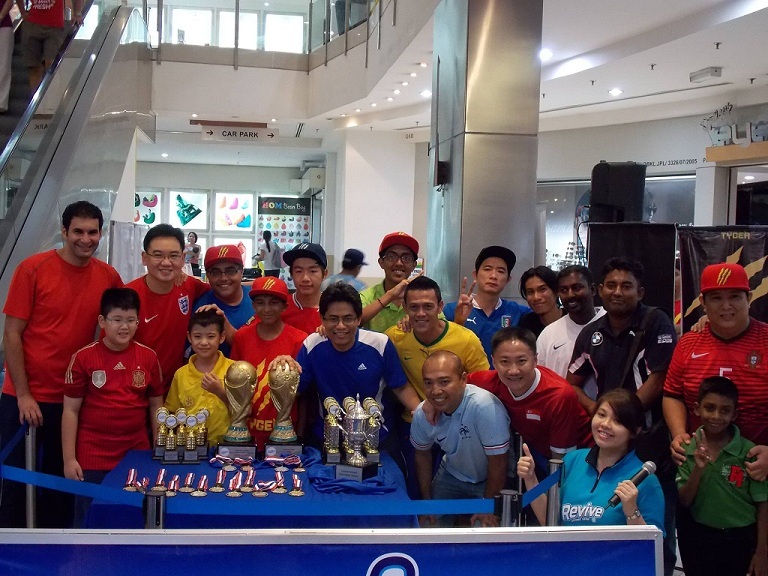 A total of 23 players took part in the Open event – 10 from Malaysia, 12 from Singapore & 1 from France. Some of the Malaysian players were new members of Hartamas Tigers SC taking part in a tournament for the first time – a healthy sign that the game & player base is also growing in Malaysia. The players were drawn into 6 groups – 1 group with 3 players + the remaining 5 groups with 4 players each. The top-placed players in Group A to D qualify for the quarter-finals while the 2nd-placed players join the top 2 players in Group E & F in a barrage play-off to determine the remaining 4 quarter-finalists. No major upsets & surprise results were seen in the group stages & the barrage play-offs as all the stronger players played true to their form by winning their respective groups & play-offs to make the quarter-finals. Similarly, the quarter-finals also panned out according to script with the higher-ranked players winning their respective games to qualify for the semi-finals. The only exception was the quarter-final between Michael & Bernard. Nothing can separate them as the scores remained tied at 0-0 at full-time & extra-time. In the end, Michael held his nerves better & prevailed 3-1 in the penality shoot-out. True to their current FISTF ranking, the top 4 ranked players – a.k.a. the usual suspects – made it into the semi-finals i.e. Ouabi, Den Mulia, Kok Wee & Michael. 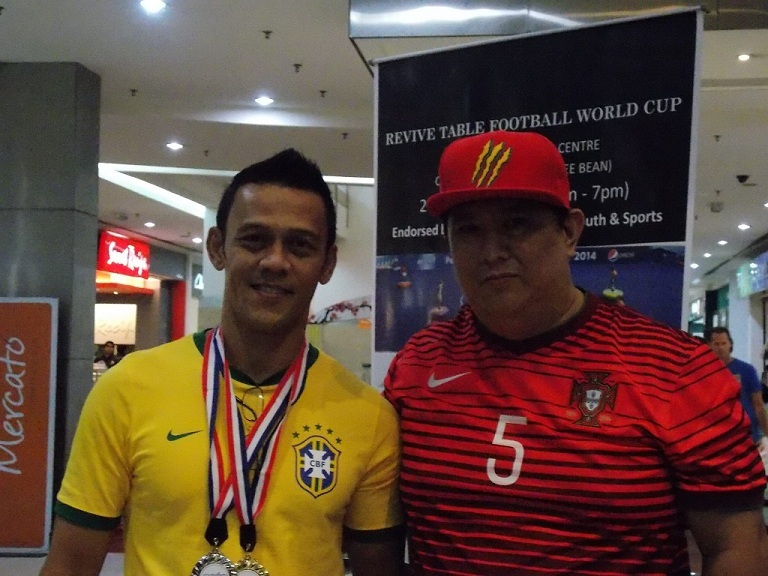 The 3rd/4th placing was another close affair as perennial rivals Kok Wee & Michael slugged it out to determine who is the better player on this occasion. Given that both players are of similar skill & experience levels, such games are typically decided based on the form & nerves of the players on the day. 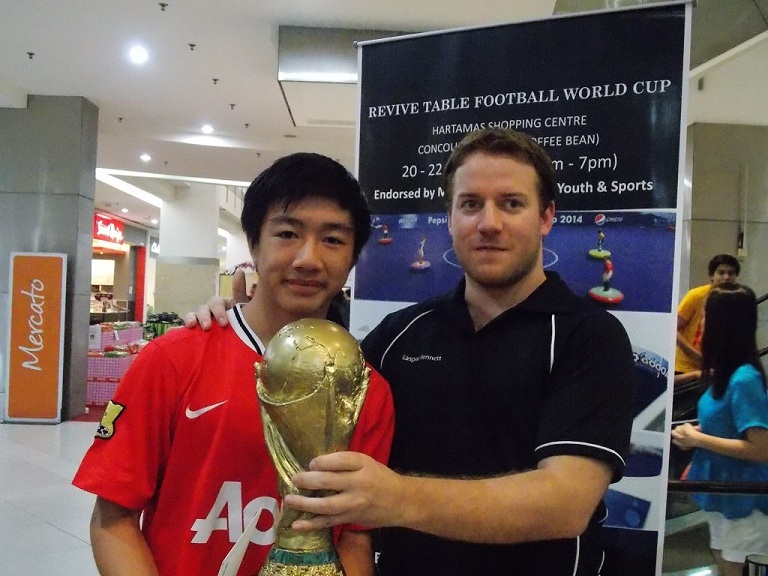 On this ocassion, Michael ran out 1-0 winners as he avenged his semi-final defeat to Kok Wee in the previous FISTF Open tournament – the TFAS Cup in March 2014. Additionally, Michael also won the Kaspar Bennett Challenge Trophy … seen below being presented with the trophy from Kaspar Bennett himself … Well done, Michael. TFAS would like to thank all Singapore-based players who made the trip up to Kuala Lumpur Malaysia as part of the TFAS contingent. Well done to all & congratulations to all prize & international cap winners!! 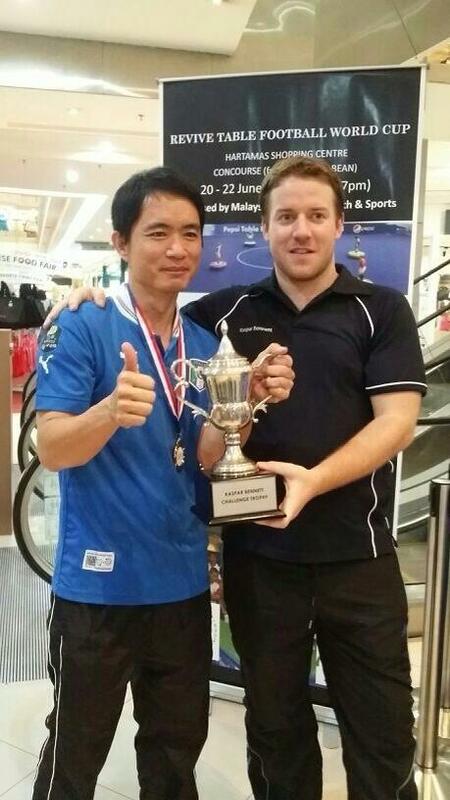 TFAS would also like to congratulate Hartamas Tigers SC founder Jamie Kong & his team for having successfully organised the history-making first-ever FISTF tournament in Malaysia; comprising both local & foreign players!! Great job Jamie!! Last but not least, existing friendships are renewed & new friendships are forged over the course of the Tournament over the weekend. 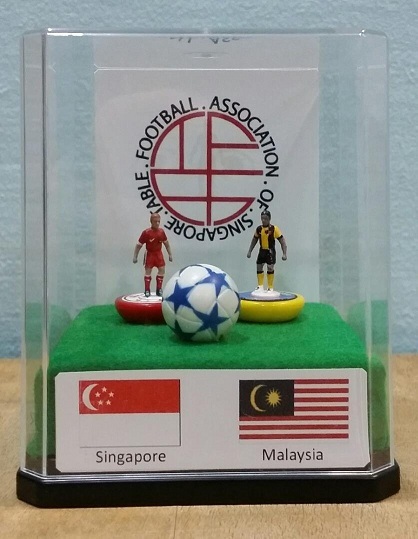 TFAS sincerely invites our friends in Malaysia to the TFAS World Cup in Singapore on 28 – 29 June 2014 @ SAFRA Toa Payoh. 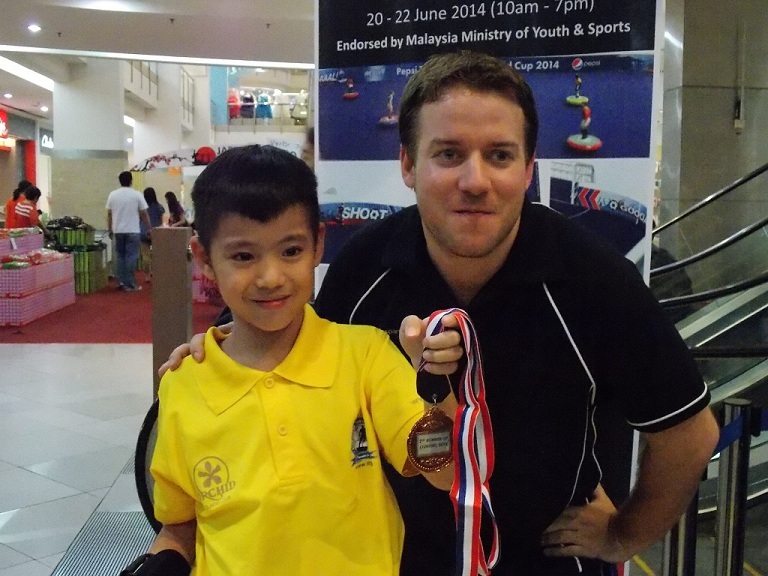 Hope to see Jamie leading a Hartamas Tigers SC Malaysian contingent to Singapore this coming weekend!! … See you all in Singapore! !